We're so glad you’re reading this. Why? Because fixturing your material to the machining bed is one of the most important steps of using the Bantam Tools Desktop PCB Milling Machine, and it unlocks a whole world of good stuff. It also saves you from a world of bad stuff. Fixturing, also known as workholding, is the means of securely attaching your material to the machining bed. Good fixturing is the difference between quickly and cleanly milling a design versus having a ton of chatter or causing your material to dislodge from the bed and go flying somewhere. Good fixturing allows you to use more aggressive feeds and speeds to achieve faster milling times, a nicer surface finish, and longer tool life. Good fixturing allows you to produce the same part multiple times with very little setup time. It’s the foundation (somewhat literally) of good machining. How should I fixture my material? There are many ways to fixture your material, but they depend on what material you’re using, the type of job you’re doing, and your level of machining experience. Scotch double-sided tape, which comes with the milling machine, is great for circuit boards that have larger features. It’s cheap, easy for anyone to use, and does a good job of securing light, thin, relatively soft circuit boards to the bed. However, it’s not great for harder materials like metal because the machine has to use more force to push the tool into the material, and the tape isn’t strong enough to withstand it. For harder materials, and when milling circuit boards with smaller features, using high-strength double-sided tape is a much more reliable option than using Scotch double-sided tape. Apply strips of high-strength double-sided tape on the bottom of your material, covering as much surface area as possible. Avoid having strips of the tape overlap or wrinkle. Remove the backing, then place the material on the bed of the milling machine. 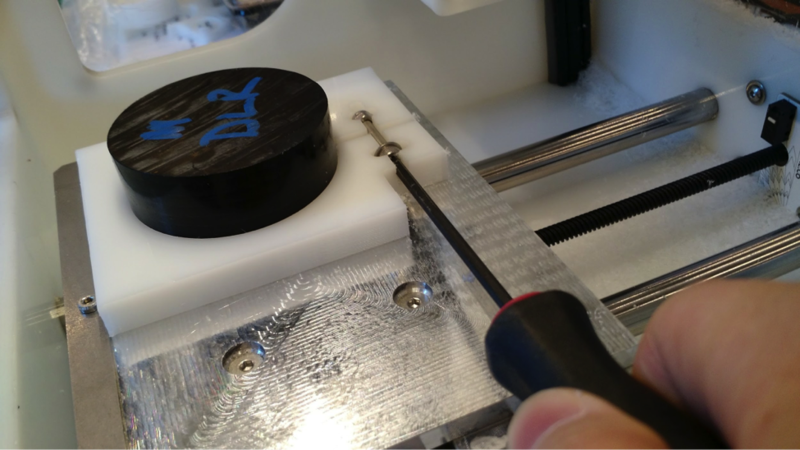 Press down on the material to make sure all of the tape is securely attached to the bed. Here's an example of what this would look like when milling a FR-1 PCB blank. The Precision Fixturing and Toe Clamp Set provides rigid, consistent workholding without the use of tape or glue. It can be used to precisely locate the corner of your material, just like the thin alignment bracket that ships with every milling machine. It works well with metal that's at least 1/8"(3 mm) thick and with softer materials that are 1/4" thick or more. Thinner stock tends to buckle and won’t stay flat under heavy clamping loads, so thicker stock is generally better. Read the full guide to learn more. Bolting your material to the T-slot bed provides exceptionally strong fixturing for almost any material but is more difficult to use for beginners and takes longer to set up. Because bolts are much stronger and more rigid than other methods of attached the material to the machine bed, like tape, there's less vibration in the workpiece. Less vibration means you can mill faster, achieve greater precision and nicer surface finishes, and increase the life of your cutting tools. Pretty awesome! The trade-off is that it takes longer to set up and there are more steps involved. Read the full guide for details. If you want to make a complicated project multiple times, you may want to make a custom fixture. This is especially useful if your project requires machining more than one side of the object. A fixture that is specially made for that project can securely hold your part, while also precisely positioning it so that multiple machining operations all align with each other. It can also greatly simplify the process of attaching your material to the bed. A custom fixture is generally comprised of a piece of material bolted to the bed, with a shape cut out of the middle to hold the object that will be milled. Many custom fixtures have locking mechanisms that can be tightened to secure the material being milled. Read the full guide for details. 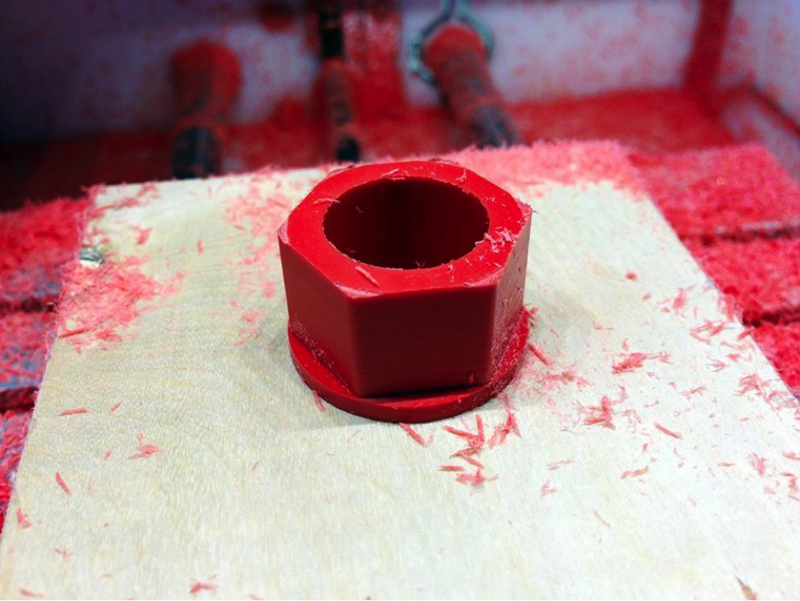 This is a simple custom fixture consisting of a piece of wood with a hole in it for the red Delrin piece. This is a more sophisticated fixture made from HDPE. It includes a hole for the material to fit into, plus a locking mechanism to secure it. We encourage you to experiment to find the best fixturing method for your project. If you have any questions, please don't hesitate to email us at support@bantamtools.com.